A little something to brighten your day. This story comes to us courtesy of Jeff Watkins, the properietor of Cloud City Comics and Toys in Syracuse, New York. His store--which sits in the Shoppingtown Mall food court, the onetime site of a battle between Tom Peyer and Rags Morales' android Hourman and his foes--is one that we've written about before. A small retailer, Watkins loves comics and is often the only store in town to participate in things like midnight openings for "event" comics and organizing local conventions and signings. Yesterday I walked from my store to my car through the mall. There was a special needs kid that was walking next to me. I was wearing a dark blue V-neck t-shirt and my thick Clark Kent classes. Hair was dark from the product in it and was firmly in place, except for the little spit curl on my forehead. He kept pace and I said hello. He had to ask me something. He leaned in close and whispered "Are you Superman?" I chuckled a little bit. "Thanks kid. No." His face remained dead serious. "I won't tell anyone." He said. "You're very nice. Thank you. I'm not though. Superman isn't re..."
And this kid had this look on his face. "I. Won't. Tell. Anyone. I promise. I swear." I'm an emotional guy so I was getting a little choked up. "We are not supposed to talk about secret identities, kid. It can get dangerous." And he starts enthusiastically nodding in agreement. "I know. I know." When I was almost to the doors, I turned back and took my glasses off and I put my finger up to my lips and I went "Shhhhhhhhh." And as best as his limbs would let him, he gave me a thumbs up. I've been welling up thinking about it for about 24 hours now. Thought I was crazy until I told Shanna last night and she had the same reaction. 100% totally true story and despite his disadvantages in life, perceived and real, I thank that kid for being a superhero yesterday. The story went viral shortly after Watkins posted it as a status message on Facebook, with other comics fans reposting it to Reddit (where it made the front page), Cheezburger and other social link-sharing sites. 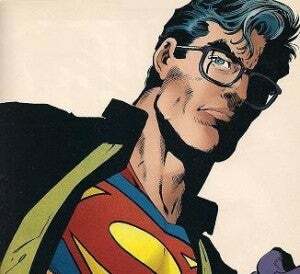 Jeff's story is not only a great reminder that the characters in comics mean something--even to those who may not be old enough to read most of what the Big Two is putting out yet--but of the enduring appeal of a character like Superman, who is constantly facing those nagging "Is he relevant anymore?" questions.